My 10-year-old daughter was an enthusiastic and avid reader from the day she figured out how to sound out words. She reads everything: novels, biographies, Ranger Rick, the side of the cereal box. In contrast, my son was much harder to interest in books. He was so disinterested, in fact, that I went into his 1st grade teacher conference convinced he needed outside help with reading. Imagine my surprise, then, when we learned he was one of only two boys in the top reading group, and that his aptitude was galloping ahead. It turned out that we just didn't have books at home that interested him. I checked dozens of books out of the library, trying them out in turn. My son is, like many people I know, very binary: if he loves a book he dives in and shuts out the world. If he doesn't, he's distracted, frustrated, and ornery. I'm always looking for book suggestions for either of my children. I wrote recently about books for strong and smart girls. 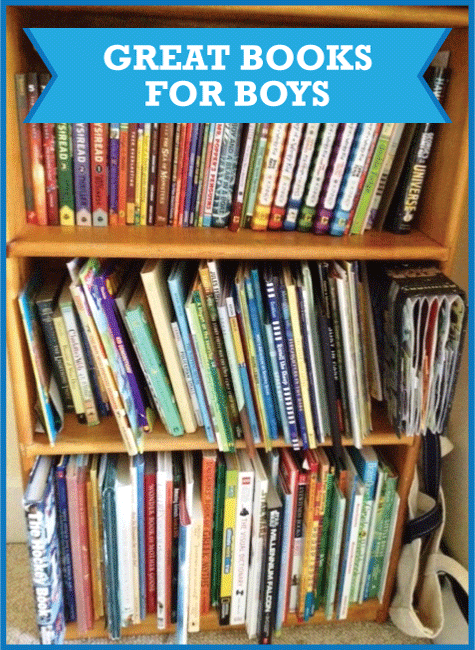 Today, I wanted to share some great books for boys (which would of course be wonderful for interested girls as well!). I'd welcome any you have to share, too! 1. The My Father's Dragon trilogy (My Father's Dragon, Elmer and the Dragon, The Dragons of Blueland) by Ruth Stiles Gannett is one of my go-to birthday gifts now. Whit absolutely devoured this tale about a boys' travels in an imaginary world. The illustrations are wonderful too, and make the book accessible to beginning chapter book readers. 2. The Return to Titanic books (Overboard, Stowaways, Time Voyage, An Unsinkable Ship) by Steve Brezenoff likewise captivated Whit. The adage that boys prefer non-fiction has rung true in my house, and these books, while fiction, are based on an actual event. 3. 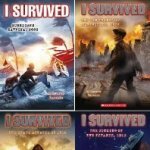 Whit loved the I Survived series by Lauren Tarshis, which addresses enormous moments in American history through a fictionalized I-was-there lens. He has learned about Gettysburg and Pearl Harbor. I was concerned that these stories would be too "real" and therefore scary, but that has not been at all true. 4. The Frankie Pickle series, by Eric Wight, was the first that Whit read in its entirety. He laughed out loud at the adventures of Franklin and his alter ego, Frankie Pickle. 5. The wonderful The New Way Things Work by David Macaulay surely speaks to a fascination with non-fiction. Whit is constantly asking questions about why and how and this book is a terrific way to slake some of that interest. The illustrations are also marvelous. It's another book I love to give as a gift. 6. Whit's godmother sent him Hereville: How Mirka Met a Meteorite, a graphic novel about the adventures of an Orthodox Jewish girl named Mirka. He could not put this book down. A spunky female protagonist, on top of a book my son loves? Bingo. What books have your sons gravitated towards? Share them in the comments below!